An East Asian nation with the recognition of the maximum population in the world, China is one of the fastest growing economy. It is also known as People’s Republic of China. It has witnessed the growth beyond the expectation in the last three decades across sectors. The percentage of the students going for MBBS in China has considerably increased. The level of education in the county has become incomparable specifically in the medical sectors encouraging international students for MBBS in China offering international standard of the course in medicines. Candidate with the great hope in mind today are found struggling to seek admission in the top 5 medical colleges facilitating MBBS in China at a comparative tuition fee. Today, students from the varied corners of the globe travel all the way to seek admission in the top medical universities for MBBS in China every year. The stay in the country is made safe, comfortable, and pleasant for the international students coming for education in the different fields. The country has a long history and numerous places of visit. It also has the number of tourist spots along with the 7 wonder – The Great Wall of China. There are a number of the educational organizations in the nation engaged in offering the medical education of the international standard to candidates enrolling with us for the various professional courses. In congruence to the education standard in other Asian nations, the standard of studies in China is more in demand. The curriculum for the varied courses including MBBS are designed under the close observation and guidance of the proven experts in the particular subjects. There are SMEs (Subject Matter Experts) who further play a very important role in the finalization of course materials and study materials. The course curriculum is easy to understand also for the below average students. The percentage of the aspirants looking in for admission in the Top Medical Universities in China is continuously increasing due to many good reasons. Here, we are going to discuss about everything a candidate interested for MBBS in China would love to learn. If we talk about the facilities in the prestigious universities for the candidates, you will find it unmatched. The state of the art infrastructure in the Medical Universities include Spacious classrooms with good ventilation, digital library, Wi-Fi connectivity 24×7, round the clock water and power backup, laboratories with the latest equipments, auditoriums for the meetings, facilities for the practical sessions, 100% safe, engaging, and heath study environment. Students already pursuing MBBS in China are having good time and are on their journey to the bright career. For the students interested for the course in medicines, there are a number of the MCI approved medical universities in China. In the last one decade, a good percentage of the candidates from India has enrolled for the MBBS Program in the varied Chinese Medical Colleges. Many candidates have already been practicing in the health sector in India and a few others are pursuing their course in medicines. You can also fulfill your dream of seeking admission in the best MBBS College In China with the professional support rendered to you by the highly experienced Study Abroad Consultant Study Sevenseas located in Delhi. Know Why Fee in Medical Universities is low in China? It is a very important and frequently asked question by parents interested in sending their loving children for the MBBS Studies in China. Although the low fee is in the interest of guardians, they are left behind puzzled. Let me tell all our readers that the medical organizations and institutes are owned by state in China as a result of it those medical institutions draw huge amount of support and Government funding. Under the Communist party rule, Education and Public health were the prime focus. that resulted in the construction and renovation of enormous infrastructure of Hospitals, Medical Equipments, Labs, Blood banks, hospital buildings, and more that were built to get rid of the deadly diseases under a special drive and also to make sure the hassle-free availability of medical facilities to the citizens at the lowest cost. It resulted in the extreme promotion of education in medicines with medical institutions having the massive capacity to appoint students over 2000. In comparison to the international norms prescribed by WHO (World Health Organization) i.e. 1:1000 , China has already achieved Doctor: Patient ratio of 1:950 which is far better than the number of the developed countries. All these state owned medical institutions were kept open for even for students from abroad willing to pursue MBBS in China helping them take the unlimited advantage of the low fee as a part of globalization of education. The another reason to encourage more foreign students for the courses in medical field was to earn more foreign exchange. WHY GO FOR MBBS STUDIES IN CHINA? There are several favorable reasons that encourages a student go for MBBS Studies in China. Every year, thousands of the students in India are unable to confirm their seat in MBBS in the medical colleges as a result of it, they plan for MBBS in international countries. Also, if you explore more information, you will notice that the percentage of the male and female candidates from India going for MBBS Study in China has increased considerably. We here at Study Sevenseas understand the struggle in getting admission for medical program in India. As the Indian colleges takes admission through entrance tests such as AIPMT / NEET / MH-CET etc. Getting admission in government colleges is as tough as climbing Mount Everest. Only 2% of students get the admission in government colleges through these tests and rest 98% struggle to get admission in private medical colleges in India due to high competition, high fee structure and huge donations. 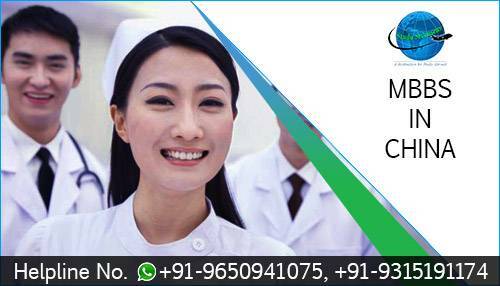 Hence we have come up with the solution of study MBBS in abroad like MBBS in China, Georgia and other countries. Study MBBS in China is a great option for Indian students due to affordable fee structure, simple and systematic admission process, MCI recognized colleges, quality education and valuable MBBS degree. Students can choose over 45 MCI recognized universities in China. Direct and easy admission process. No Entrance Exam and No Donation required. Medium of instruction is English. MCI, WHO approved Medical Universities. Affordable and world class hostels and lodging facilities for girls and boys separately. Great Career Anywhere after completing MBBS from China. Food as per your taste. MCI coaching during the internship program. International level education system with practical knowledge and modern technologies. Well educated and experience faculty. Training in the hospitals and interaction with the patients and medical treatments from the first year. A list of the MCI (Medical Council of India) approved Universities / Colleges is released every year by the Ministry of Education of People Republic of China to permit foreign students from all over the globe study medicine (MBBS) specifically in English language. It is obligatory for the candidates and parents to stay careful and check the list before proceeding with the process of admission in the top MCI approved Universities in China. It will certainly help you avoid the disappointment experienced on taking decision in haste while planning for study MBBS in China. The medium of teaching for the MBBS course will be in English in the 44 listed MCI endorsed medical institutions in China. It is strongly recommended and essential to make sure you seek admission for the MBBS Study in China only in the MCI (Medical Council of India) recognised medical universities based in the country China. Students planning to seek admission to the MBBS course in the prestigious universities or educational institution can have a look on the new list of 214 MCI Approved Medical Universities for MBBS in China. School of Traditional Chinese Medicine of Capital Medical University, Beijing. Shanghai Jiao tong University School of Medicine, Shanghai. Tongji University School of Medicine, Shanghai. Nanjing University of Chinese Medicine, Hanlin College. Zhejiang University School of Medicine, Hangzhou. Wuhan University School of Medicine, Wuan. Institute of Medicine and Nursing, Hubei University of Medicine. Xian Jiaotong University College of Medicine, Xi’an. MBBS program duration in China is of six years. The course is bifurcated into two parts. First one consists of 9 semesters, which includes the informative study. In the last three semesters, students go through internship. In the informative part, first six semesters are only dedicated to basic subjects in medical sciences and in the last three semesters students go through the clinical courses. Curriculum of this course can be divided into three parts. In the first one, subjects related to Basic medicine includes Anatomy, Biochemistry, Pathology, Pharmacology and Physiology. The second part deals with Preventive Medicine and different Scientific Research Methods. Third part deals with Clinical medicine, where students gain knowledge and develop their skill in Diagnosis, Ophthalmology, Surgery, Dermatology, Venereology, Psychology, Psychiatry, Pediatrics and other subjects. During the last stage of the course, students go through one year of compulsory internship. In their last semester, they need to complete elective internship. Students have the option of completing the internship in their native country also which could help in reducing their tuition fees. After completing the internship students have to appear for the final examinations, which comprises of both theory and assessment of clinical skills. And finally qualifying this examination, students will be conferred with MBBS degree. To apply for MBBS in China, Indian students need to be of at least 18 years of age and the maximum age limit of 30 years. Students must have 60% marks in their intermediate. To seek admission in MBBS course It is necessary to have a good educational record and good character else students will not be granted admission to the universities in China. Foreign citizen with valid passport, and in good health. Aged from 18 to 30, a few universities accept applicants aged over 30. Possessing senior school degree or above. Old HSK6 (or new HSK5)or above is required for application of liberal arts, economics and management majored students. Old HSK3 (or new HSK4) or above is required for application of science, engineering and medical science majored students. For details please refer to requirements published by the university. Free English Language testing for students from English speaking countries. Free English Language testing for students from countries in which English is the major teaching language on condition that the relevant proof documents were provided. TOEFL 550, IELTS 5.5 or Pass University’s entrance examination. Recent passport size photos as mentioned in the Visa Application Form. Health Check-up Form / Physical Examination Record. Fill the query form at Study Sevenseas and receive required information. Send the copies of your academic documents. Receive the Admission letter from the University. Deposit the University Tuition fee and send us the transaction slip. Provide us the documents for Visa processing. Searching your very own lodging can be difficult in a foreign country; however, you do have some of the alternatives when determining the type of accommodation you need to live in China. Universities commonly provide housing especially for international students, so communicate with your college housing before you start searching on your very own! Or simply speak to our counselors to provide you with an accommodation that suits your living style and budget. There is mainly two type of accommodation for Indian students in China, Campus Housing which is provided by the University and Private Apartment that you have to find on your own. Besides, some students also live with a host family to save on more expenses and this also helps them to get close to the Chinese traditions and lifestyle when living with a typical Chinese family in their house and share expenses. WHY STUDY SEVENSEAS FOR MBBS ADMISSION IN CHINA?